Books written in Judæo-German in Hebrew script, and containing stories, legends, and tales ("ma'asim") on various subjects, most of them relating to Jews and Judaism. They originated about the beginning of the fifteenth century, when Jews were living in the Rhenish provinces, and were further developed during the migrations to Russia and Poland. Like the name "ma'asehbuch" itself, this entire literature is a mixture of Jewish and German, both in language and in substance.The first products of Judæo-German literature, which is very voluminous, were principally translations of the prayer-books and the Bible, and devotional books. The ma'aseh books constitute a group by themselves; their object was to furnish entertainment and instruction for women and girls, who, unlike the men, were not in duty bound to learn Hebrew. Where the subject is a non-Jewish one, Hebrew words may be altogether lacking in the story, except the invariable formula at the end of the book— and , or a note in Hebrew regarding the author, and a Hebrew verse on the title-page. At first the writers generally chose non-Jewish stories, but as the literature developed, Jewish subjects were given the preference. It is to be noted, furthermore, that in the earlier period consecutive stories of considerable length were employed, while later the ma'aseh collections took the form of readers and anthologies containing short stories ending with a moral; for this reason fables also are included. The non-Jewish subjects at first selected were various in nature. Indeed the Jews were led to make these collections by their acquaintance with the stories from the cycles of King Arthur, Dietrich of Bern, and the "Nibelungenlied," all of which were well known in the region of the Rhine. Thus a Judæo-German version was made of the poem "Ritter aus Provincienland, Sigmund Is Sein Name Genannt, und Magdalena, Tochter des Königs von England." In 1501 Elijah Levita composed at Venice the well-known Baba Buch or "Bovo-Ma'aseh," a Judæo-German rimed version of the English romance of Bevis of Hampton, following Italian versions in which the hero is called "Bovo d'Antonia," the form of the name which gave Levita's rendering its title. Sources apparently the most remote were drawn upon for material, such as the facetiæ of Till Eulenspiegel, and even Boccaccio's frivolous tales, which found their way into Judæo-German from Dutch versions. Side by side with this foreign material Jewish tales were developed and remodeled. The Bible, especially the stories of Joseph, David, and Samuel (the "Schmuel-Buch," Basel, 1612), offered rich material, while Jewish history and literature furnished an abundance of subjects. There are also Judæo-German historical works, such as the "Yosippon," "Shebeṭ Yehudah," and "She'erit Yisrael" (Grünbaum, "Jüdisch-Deutsche Chrestomathie," pp. 345, 357, 361). The stories of Judith and Esther, of the heroic wars of the Maccabees and the destruction of the Temple, were retold, mingled with many legends; and later works, such as the "Ben ha-Melek weha-Nazir" (Prince and Dervish), were also translated. Jewish readers, curiously enough, preferred the books dealing with non-Jewish subjects (comp. Cornelius Adelkind's introduction to Levita's translation of the Psalms and the introduction to the ma'aseh book of 1602). Although Perles has shown ("Monatsschrift," 1876, pp. 351 et seq.) 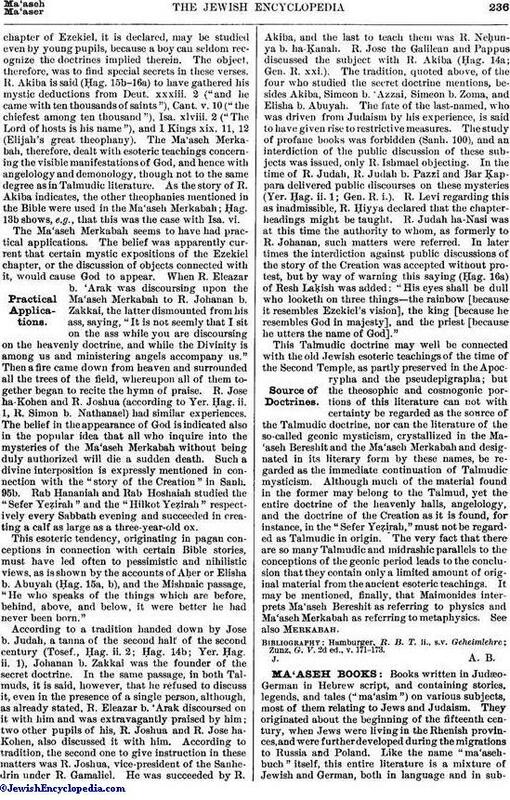 that in the stories belonging to the Dietrich cycle the passages with a Christian coloring were replaced by others, a change which was probably made also in other non-Jewish stories, yet such alterations did not suffice for the real purpose of the ma'aseh books, which was to furnish instruction in Jewish history and literature for those who were ignorant of Hebrew. To remedy this defect a pious Jew issued in 1602 a work known simply as "Ma'asehbuch," purporting to be a collection of Jewish legends and historical tales and without any admixture whatever of foreign elements. The collector indicates his purpose in the preface as follows: "Here cometh a beautiful Ma'aseh Book, ye dear sirs and dames; now look upon the beautiful Ma'aseh Book, which has never before been published in the world, and contains some three hundred ma'asim, all made from the Gemara and also from the and Beḥai; and also from R. Judah Ḥasid's ma'asim ye will miss none; and also from the Sefer Ḥasidim, and the Sefer Musar, and the Yalḳuṭ, as ye may see below in my 'simanim.' Therefore, ye dear dames, ye now have the German books all before you, and ye have likewise the German Gemara, even as ye have 'kol hattoro kullo gor.'" Then in Hebrew: "By order of Jacob b. Abraham of blessed memory, of Meseritsch in Lithuania. Here at Basel the great [city], 362 [i.e., 1602], by Herr Conrad Waldkirch." Despite the author's intention, some non-Jewish stories found their way into this book. Steinschneider assumes that its compiler lived in western Germany in the last third of the sixteenth century. A German translation of it was published by Christoph Hellwig (Helvicus), together with notes that are anti-Jewish in tone (Giessen, 1612). The "Ma'aseh Adonai" and the "Ma'asehbuch" (Wilmersdorf and Rödelheim, 1752) from which Grünbaum published extracts ("Chrestomathie," pp. 385 et seq. ), may also be noted here. All the works belonging to this class of literature are very similar in content, being compilations of an undigested series of anecdotes from various Jewish books, especially from the Babylonian Talmud, the Midrash, Yalḳuṭ, the Zohar, and such historical books as the "Yuḥasin," "Shalshelet ha-Ḳabbalah," and "Shebeṭ Yehudah." Each story begins with the words "Ma'aseh es geschach" or "Ma'aseh es wor einmal" ("a 'ma'aseh' happened," or "there was a 'ma'aseh' once upon a time"). The authors prefer to narrate instructive stories or miracles of anonymous ḥasidim, and they frequently tell tales of famous Jewish rabbis like Maimonides and Luria, or of earlier ones like Joshua ha-Levi and Akiba. Often the stories are noble and lofty and sincere in their religious feeling, and are told in simple, straightforward language. The ma'aseh books contain highly valuable material for the knowledge of the life and thought of the Jews of the Middle Ages, but as yet they have scarcely been studied from this point of view. A detailed bibliographical list of this literature is given by Steinschneider in his Bodleian catalogue. 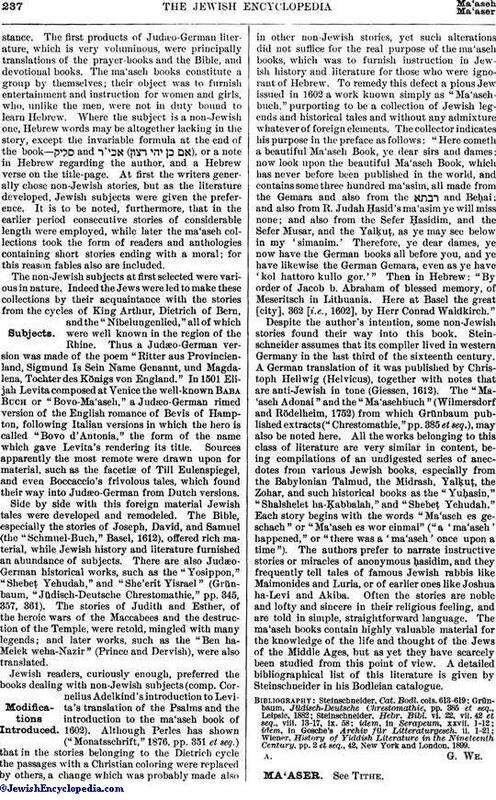 Wiener, History of Yiddish Literature in the Nineteenth Century, pp. 2 et seq., 42, New York and London, 1899.